Today we hosted Dr. Heather Kaese, a veterinarian and ophthalmology researcher who is working to understand the genetic links between uveitis and Appaloosas. As we documented in our new Web site, BlindAppaloosas.org, Appaloosas are much more likely to get uveitis, the leading cause of blindness in horses, than other breeds. Consequently, blindness in Appaloosas is, sadly, far too common. So Heather and her research team are trying to find out why Appaloosas are at such risk for this disease. Heather is a board-certified internal medicine specialist and a resident in ophthalmology who currently practices in Kansas City. Earlier this year we sent Heather and her research colleagues blood samples from all of our blind Appaloosas. Her visit today was to do actual eye exams on each of them to confirm that they are in fact blind from uveitis. If any of them had turned out to be blind from something else, it would skew the research data. Dr. Erin Taylor, our equine vet who is a board-certified surgeon, and our small animal vet, Dr. Brenda Culver who has a special interest in ophthalmology, also came out today to work with Heather. 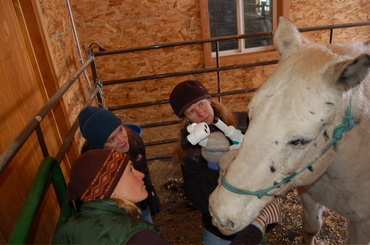 In the photo above, you see Erin on the left, Brenda in the middle, and Heather on the right holding the slit-lamp. They're examining blind Rocky, one of our 13 blind Appaloosas. Heather confirmed that all of them were indeed blind from uveitis. Our horses are just a small part of the data sample that the researchers are collecting, and we're delighted to help in any way we can. Now if only we could get the Appaloosa Horse Club, the official breed association, to acknowledge this problem in the breed and devote any resources to the research effort ... that would really be something. A new Web site devoted to all things dog, called appropriately enough DogTime, just published a story on the sanctuary this week. 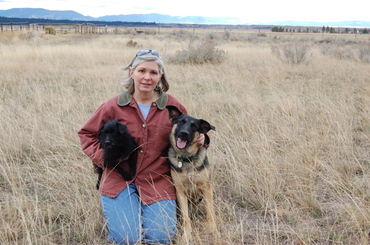 The writer, Leslie Smith, and her husband Mike had come out to the ranch for a visit this past summer, so Leslie is writing from first-hand experience. As you'll see, Leslie features blind Evelyn as an icon to illustrate what these special animals are like ... and what kind of life they enjoy. The image above is what I took as a screen shot from their home page. You can read the story here. One of the things we do is spend a lot of time emailing or on the phone answering questions and helping folks who have disabled animals. This is particularly true when it comes to blind horses. A few months ago we were contacted by a couple in Maine who had just decided to take a blind foal. Now, this is very unusual, because typically when we get a call about a blind foal it's because someone wants us to take it off their hands. Not this time. The couple, Lisa Bither and Jim Arthur, had seen our BlindHorses.org site and had some questions about caring for the blind baby they had just agreed to bring to their Black Horse Farm. We've been in touch with them a number of times since then. Well, the baby is now nearly four months old, and the local paper in Lewiston, Maine -- the Sun Journal -- did a story yesterday on the foal and her new life at Lisa and Jim's farm. The photo above is one that ran with the story, which was headlined "Blind Love." You can read the Sun Journal article here. Our hats are off to Lisa and Jim for saving this little girl! Speaking of news articles, the Helena Independent Record here in Montana carried a story in today's paper about our recent award from the International Fund for Animal Welfare. You can read the story here. Note that the article somehow placed us in Helmville rather than Ovando (no, we haven't moved! ), and Alayne hasn't changed her name to 'Elayne,' but it's a very nice piece. I was feeding the dogs at Widget's House yesterday evening when I looked across the room and deaf Tyler doing his pathetic routine. He is one of the original 'drama queens' at the ranch ... a dog who can look tragic in an instant, simply to get you to envelop him in your arms out of sympathy. (Clever, eh?) He also can appear thoroughly conflicted -- so he'll have his tail tucked between his legs and a haunted look on his face, like he's scared to death of you. But when you drop to your knees and open your arms wide, he'll run right to you ... with his tail still tightly tucked. A minute later he's running around, tail up, being goofy. Then he's back to interminable sadness, as if the weight of the world is on his Pointer shoulders. I tell him he really does not need to worry about the Dow plunging 237 points, Pakistan unraveling or global warming. But fret he does ... until absolute joy overtakes him. We never quite know what he's thinking. As Alayne likes to say, "Tyler lives in Tyler's own little world." And what you see in the photo is what he does at dinnertime on occasion ... sitting hunched over in the middle of the room, looking and acting pathetic, hoping to get fed before anyone else does. No, it doesn't work, but it doesn't keep him from trying! 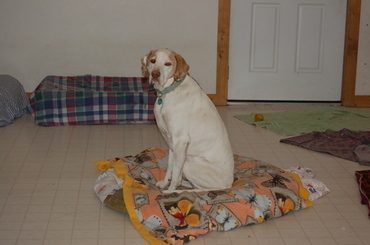 I took this photo of blind Emmy Lou late this afternoon when I was at Widget's House, our main dog building. I didn't have a particular subject in mind when I headed over with the camera, but Emmy Lou clearly had herself in mind. She would not leave me alone. She followed me all over the yard, and when I would stop walking, she'd stop. I'd take a few steps back to get a better shot of her, she'd move right toward me. My biggest problem was just keeping her far enough away ... say, two feet! ... that I could frame a shot. Her hearing is not good -- she can't tell which direction sound is coming from -- but if she gets close to you, she'll use her sense of smell and what hearing she does have to stay near you. So I just kept shooting away as she kept posing for me, and ended up with that unique shot above. Once she realized Dusty was not going to play with her, she turned around to come find me again. Apparently she thought I needed to take some more photos of her. I took this photo late this afternoon, as Alayne and I were finishing up barn chores on a beautiful if brisk Thanksgiving Day. 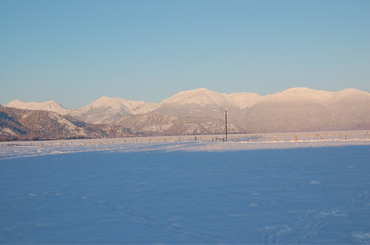 The view is to the northeast, and the peaks you see are in the Scapegoat Wilderness, part of the enormous Bob Marshall Wilderness Complex. As the sun was dropping, so too was the temperature. By the time we got indoors, it was already just three degrees above zero and headed lower. It took a few hours to get all the horses fed and into their stalls for the night. Then Alayne fed the "cottage dogs" (the 20 who live with us or in the cottages next to our house) while I went over to feed the 20 dogs at Widget's House. With everyone fed, Alayne and I were able to finally start on our dinner -- the Thanksgiving Day feast! -- about 5 p.m.
At some point this evening the temperature dipped below zero, but as I write this it's crept back up to 7 above zero, thanks to some cloud cover that rolled in. I had already split the wood for the evening's fire, and the woodstove is keeping us plenty warm in here. And now that it's 9 p.m., it's time to head outside again -- to let the dogs out for the final pit stop, then put them up for the night. Once the dogs are done, I check in on the horses at each of the three barns and make sure everything's okay. On a night as cold as this one, everyone's very happy to be tucked away indoors! 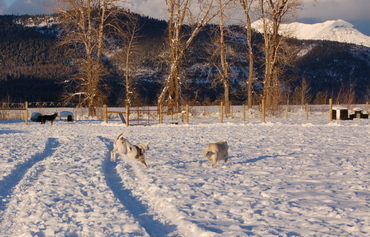 "Of course, this was Bindi’s first experience with snow (that we know of, right? ), and it was hysterical to watch. She tried to eat all of it when she first stepped out into it, until she realized there was just too much there to consume in one sitting, so she decided to go exploring. She hit the back yard and just started tearing through all the snow in huge, joyful circles. Then she put her head down and started plowing & tunneling. I thought that kind of enthusiasm for snow was just a lab thing, but apparently little blind mutts enjoy it equally as much. 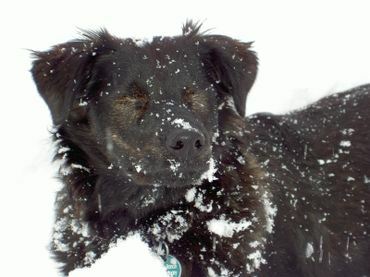 I am attaching a photo of Bindi in all of her winter glory." Photo credit goes to Brent for that shot! Yesterday evening, just as we were winding up barn chores, the rain of the past two days turned to snow. And it snowed. And snowed. We woke up today to about 8 inches, and it continued throughout the day. By tonight we probably had about 12 inches of snow. I took the photo above of little Smokey, one of the two wobbly brothers who arrived from Ohio back in October. This was their first snow ever, and they loved jumping through it. What I think they loved the most about the snow, however, was that it gave them something soft to land on when they fall! Smokey, like all of our wobblers -- dogs and cats -- has a knack for doing what I call a 'body block.' They walk straight for you (straight being a figurative term here), aiming for your legs, and then drop themselves right on top of your feet. This maneuver is deliberately designed to stop you in your tracks so you'll have to bend down and pet them. Every one of the cerebellar hypoplasia animals does this ... and it's very clever, because it works! 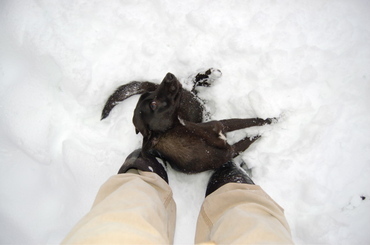 I was out trying to take photos of some of the dogs frolicking in the snow, and Smokey kept parking himself on my boots. So I looked straight down with the camera and got that photo. Our fabulous longtime volunteer, Laura B. of Helena, came out on Friday to adopt three-legged Kasha. Now, Laura is not exactly new to adopting from the ranch -- she's adopted four animals already from us over the years. That includes the little scamp she's holding in her arms in this photo, Rudy. He was only here for a couple of months before Laura fell in love with him and took him home, so he never even got his own page on our Web site. He's a wobbler who came to us from a rescue group in Salt Lake City. A number of people had expressed interest to us over the past few months about adopting Kasha, although no one ever stood up and said, "I'm ready!" But Laura had never said anything, and instead was quietly eyeing this beautiful Shepherd and thinking about making her part of the family. So when she asked me last week about adopting Kasha, at first I was surprised and then -- a nanosecond later -- delighted at the idea. We couldn't think of a better home for Kasha than the one Laura would provide. I talked with Laura a few times over the weekend and she reports that Kasha is doing great. "Kasha is such a sweet girl!," she said. Rudy is learning to adjust to having another dog in the family -- he has a case of something called SDNS ("Small Dog/Napoleon Syndrome") -- but with a little work, he's coming around. Thanks to Laura for giving this special girl such a wonderful home! I took this photo late yesterday afternoon just outside my office. 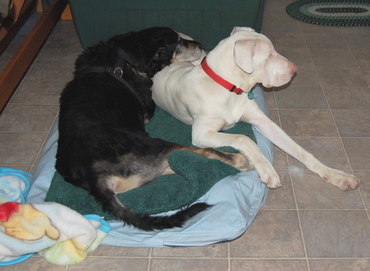 That's our old boy, Dillon, resting his chin on blind-and-deaf Blanca. This still-growing Great Dane puppy is content to lay her big frame right next to another dog, even if it means half the bed space for each of them. Dillon had been lying there peacefully when Blanca came over and plopped herself down. Since she was clearly crowding him, he decided to make the best of the situation and use her as a chin rest. Dillon, who is one of our original "Seattle six-pack" of dogs who moved out with us to Montana, is now a rickety 15-year old. He increasingly struggles to walk, and he can no longer get up on his own. He'll bark to let us know he needs help to get up. He's also fecally incontinent and has been for most of this year. If his backside looks a bit different, it's because we've clipped the hair there and on the underside of his tail. This makes it easier to clean him up, which we need to do at least three times a day. Watching him shuffle as he walks, and seeing him try to rise on his own but fail, there are days when we ask ourselves, "Is it time?" But he still loves to eat, and at bed time, his eyes still sparkle when we give him his goodnight cookie. And as stiff and awkward as the rest of his body is, he has an amazing knack for being able to catch a cookie in mid-air with his mouth. That part of his body is working great!